It’s not difficult to have a romantic weekend in Byron Bay. For starters the beauty of the rugged landscape would soften even the hardest of hearts. Then there is the mystery of the tropical rainforests, not to mention your choice of gorgeous moonlit soft sandy beaches to stroll along hand-in-hand. Since it was introduced to the world last century, hot air ballooning has always been regarded as a bit of a romantic pastime. Perhaps it’s the intense silence as you glide along up there in the lap of the Gods that makes you take a step back from the hurly burly of everyday life and appreciate what you have in each other. Hot air ballooning is the number one activity for a romantic weekend in Byron Bay for loved up couples – especially when you opt for the champagne breakfast pre or post-flight. Reconnect with each other in a spiritual sense at the Crystal Castle with its famous Buddha Walk and beautiful tropical Shambhala Gardens. A pretty, breath-taking oasis in the hinterland of Byron Bay – as well as a popular spiritual retreat – this ancient setting has a magical feel you both won’t be able to help but get caught up in. The location has even been blessed by the Dalai Lama himself. Why not indulge in a relaxing healing bath together or engage in some mutual meditation? 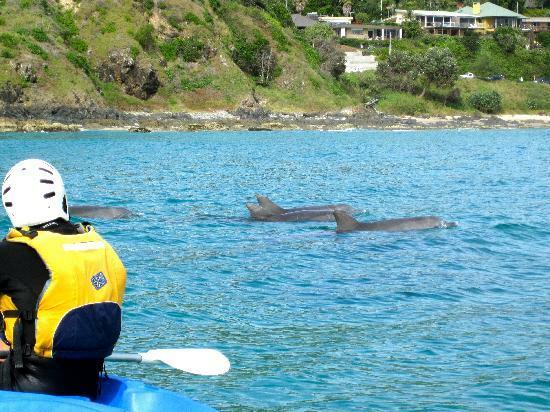 How cute would it be to kayak around in Byron Bay’s warm waters with your other half and some fun and playful dolphins providing masses of entertainment? This is an experience we can assure that you will never forget – with or without photographs to remind you of the day. Is surfing a recommended activity for romantic weekend holidays in Byron Bay? It all depends on how experienced you are in the sport we suppose; otherwise it could prove to be extremely frustrating and lead to an argument. So, if you can already surf then riding the huge waves at The Pass together can be a mighty exhilarating experience. If you’re a beginner, maybe leave it out for this weekend which is supposed to be focused on romance after all. This is undoubtedly a romantic past time; also a little thrilling and naughty. Just make sure you choose a secluded beach such as Little Wategos and that there are no families around at the time. Midnight skinny dipping is best from all points of view, we reckon. Watching the sun rise from the top of Mount Warning is très romantique – and not just for the stunning 360 degrees panoramic view. This is Byron Bay’s tallest and most spiritual mountain and plays an important part in Aboriginal folklore when the first inhabitants thousands of years ago regarded it as sacred and performed many rites there. You will no doubt be surrounded by a group of other tourists as the sun starts to make its way up from the horizon but maybe you can nip off and find a secluded spot?. Snuggle up with your other half on a Sunset Cruise and enjoy a couple of complementary glasses of wine or beer with Byron Bay Cruises. You won’t have the boat to yourself (it holds up to 12) but hopefully you’ll be so loved-up at that point that you’ll only have eyes for each other anyway. The cruises run from September to April and there are free nibbles on board too and which you can lovingly feed to each other. 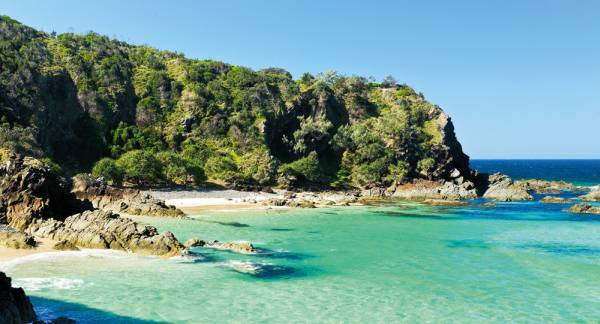 Listed as the top travel secret of Australia by Australian Traveller, Whites Beach truly is a hidden gem among beaches. The best news about this amazing beach is that it is located within Broken Head so you won’t have to travel far from your Broken Head Holiday Park accommodation to soak up some time there. Take note, though, Whites Beach takes some effort to get there. You’ll have to travel down a dirt road that winds through the rainforest, stop at an unmarked spot and hike along a path down to the beach. (Don’t worry, our staff will give you the proper directions to find this beauty!) But, trust us, it’s worth it, from the white sands, crystal clear water and many rock pools, you’ll immediately be glad you brought your partner here to snag some romantic one-on-one time. Share in the wonder of all the amazing creatures in the ocean together as you snorkel around the gorgeous Julian Rocks Marine Reserve. Through Byron Bay Dive Centre you and your partner can take a 60-minute snorkel tour of Julian Rocks. The cost is $65 per person. (This includes a boat ride, all equipment and a lesson if needed.) The reserve, just five minutes from the shore of Cape Byron Bay, provides shelter to more than 400 types of tropical fish, three species of sea turtles, rays and many more marine animals. There’s something about clinking wine glasses with your partner while waves crash on the beach nearby — it just spells romance. Located just off Clarkes Beach, Byron Beach Café features not only gorgeous views but also excellent food and great service, making it highly recommended as a must-try on Byron Bay restaurant lists. Serving some of the best food in Byron Bay, the café’s two-course lunch with wine for $35 is a popular option. In addition, if you can, try to catch one of the café’s sunset beachfront dinners, held seasonally throughout the year. It’s bound to be a lovely evening! Check the restaurant’s blog for announcements. 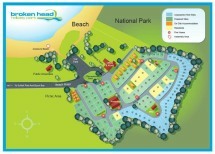 Stay at Broken Head Holiday Park for a mid-winter escape! Book a romantic weekend at one of our couple friendly beach cabins or beach shacks, or come and use one of our excellent campsites for your holiday with your partner — any of these options will make for a great accommodation to have a wonderful and memorable romantic weekend (or longer!) holiday.